The liver is the largest solid organ in body and is vital to body’s metabolic functions and immune system. It performs large number of functions such as process nutrients, extract energy, filter toxic chemicals including alcohols from the body, help in blood clotting, store iron and many vitamins etc. Without a functioning liver, it becomes very difficult for person to survive. 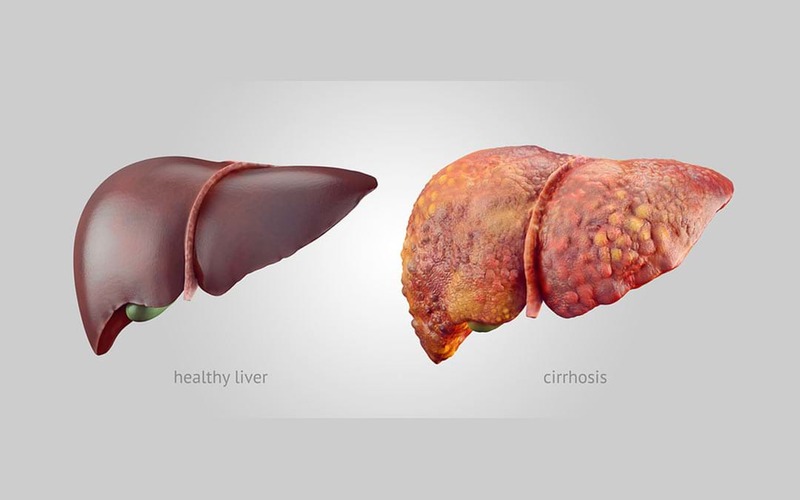 Liver cirrhosis is a slowly progressive disease in which scar tissue replaces the healthy tissues of liver. The formation of scar tissue prevents the liver functioning affecting the processing of nutrients, hormones, drugs and naturally produced toxins in the body. Treatment for liver cirrhosis is very necessary; otherwise it can be fatal for a person. Currently, it is not possible to reverse the damage done to liver; however progression of disease can be stopped depending on the cause of it. If you are having cirrhosis due to alcoholic liver disease, doctor will prescribe you to stop drinking completely. If non alcoholic disease has caused liver cirrhosis to you, doctor will recommend losing weight through physical activity and healthy eating for reducing fat, scarring in liver. Medications such as ursodial will be prescribed if you have liver disease due to hepatitis, infections, bile duct disease etc. At advanced stage of liver cirrhosis, your doctor will consider a liver transplant after they have ruled out all other treatment options. The liver transplant is potential curative option, the high costs, lack of donors, immunosupression issues make it a limited option. There is a strong dearth for developing alternative treatment modality. With the advancements made in regenerative medicine, stem cell therapy is being explored by researchers for curing liver cirrhosis. Stem cells are the naïve cells of the body, which can be differentiated to any cells if provided proper enviornement. This remarkable potential of stem cells has been exploited by the medical science as a possible cure for a variety of debilitating diseases. Various types of Stem Cells had been investigated as a regenerative therapy for liver cirrhosis. These stem cells include bone marrow mesenchymal stem cells (MSC), bone marrow mononuclear cells (MNC) and peripheral CD34 positive cells. Some early studies have shown encouraging results in patients who had autologous bone marrow stem cell transplantation. The stem cells can be harvested from potent sources such as bone marrow or adipose tissue and can be injected back into the body at the targeted place. These stem cells then can be differentiated into liver cells with the help of certain growth factors and immunological factors such as cytokines. The stem cell injection can also be coupled with stem cells stimulation therapy, wherein resident stem cells are stimulated to multiply and differentiate inside the body as a booster effect. A clinical study at PGIMER, Chandigarh carried out on patients of liver cirrhosis and alcoholic hepatitis through the stem cell therapy that involved stimulating a patient’s bone marrow by an injection called (Granulocyte Colony Stimulating Factor (GCSF) that produces new cells called hematopoietic stem cells. With the stem cell therapy, the survival was better in the patients who have taken therapy. The patients showed improvement in nutrition, better control of ascites, reduction in liver stiffness, lesser infection episodes and improvement in liver function. The use of stem cells for treating liver failure or liver cirrhosis is still at a very nascent stage, but in near future it will definitely come up as potential treatment approach for suffering with liver problem.